Jeremy Ornstein of Watertown, Mass., center, cheers on fellow environmental activists as they occupy the office of Rep. Steny Hoyer, D-Md., the incoming majority leader on Capitol Hill in Washington, Dec. 10, 2018. Environmental activists are ramping up a pressure campaign designed to drum up Democratic support for a sweeping agenda to fight climate change, with the 2020 presidential campaign in their sights. Hundreds of young demonstrators turned out Monday on Capitol Hill to push Democrats on a package of ambitious environmental goals — including a nationwide transition to 100 percent power from renewable sources within as little as 10 years — that's collectively dubbed the Green New Deal. Already embraced by Rep.-elect Alexandria Ocasio-Cortez, D-N.Y., an increasingly influential figure on the left, the Green New Deal is designed to nudge prospective Democratic presidential candidates to stake out aggressive positions on climate change. Some cast the goals as idealistic and politically risky. FILE - In this Nov. 14, 2018, file photo, Rep.-elect Alexandria Ocasio-Cortez, D-N.Y., talks with reporters following a photo opportunity on Capitol Hill in Washington, with the freshman class. Organizers with the Sunrise Movement activist group frame it as a make-or-break issue for Democratic voters, particularly young ones. But they're fighting recent history on that point. In this Nov. 27, 2018, photo, Sen. Bernie Sanders, I-Vt., speaks about his new book, 'Where We Go From Here: Two Years in the Resistance' in Washington. FILE - Sen. Cory Booker,D-N.J., speaks at a get-out-the-vote event hosted by the NH Young Democrats at the University of New Hampshire in Durham, New Hampshire, Oct. 28, 2018. Sen. Cory Booker, D-N.J., said last week that “obviously, we have been doing a lot of work trying to find some bolder things we as a nation could be doing” on climate change. 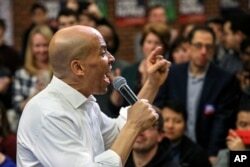 Booker spokeswoman Kristin Lynch that his staff has held dozens of meetings since the summer aimed at shaping a broad climate bill and that he welcomes the activists' effort to spotlight the issue. The Green New Deal deliberately omits details on how to reorient the United States toward the drastic carbon emissions reductions it calls for, instead calling for a select committee in the House to devise a plan by 2020. That timetable is designed to rally Democrats behind a climate change strategy as they're picking a nominee to take on President Donald Trump, who has rolled back multiple environmental regulations and cast doubt on the scientific consensus that human activity is driving global warming. 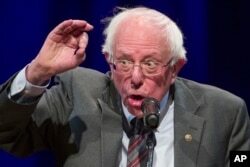 Bill McKibben, a leading environmentalist whom Sanders tapped to help write the Democratic National Committee's party platform in 2016, said that it would be “hard for me to imagine a serious Democratic candidate emerging” in the 2020 presidential race who doesn’t support a version of the Green New Deal, single-payer health care and a $15-per-hour minimum wage. A Capitol Police spokeswoman said that 138 people were arrested during Monday's demonstrations by Green New Deal supporters. 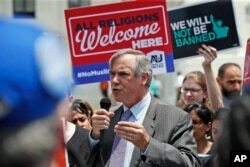 Sen. Jeff Merkley, D-Ore., speaks as protesters hold up signs and call out against the Supreme Court ruling upholding President Donald Trump's travel ban in front of the Supreme Court, June 26, 2018 in Washington. “Being the first to take the most progressive position of the day will only lead to a party that can't compete in the general election as it becomes unrecognizable to independent voters,” she said.